As usual this time of year, the siren call of the garden is practically shouting in my ear. The only way to answer it, of course, is to look indoors. It's late to start seeds in the house, but I finally got my rear in gear and got some planted. 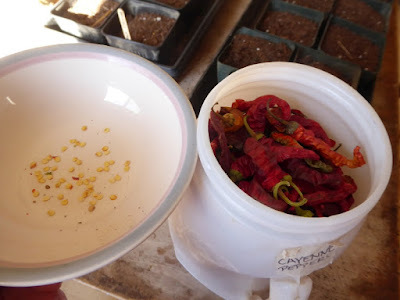 Here I'm taking cayenne pepper seeds from last year's harvest. 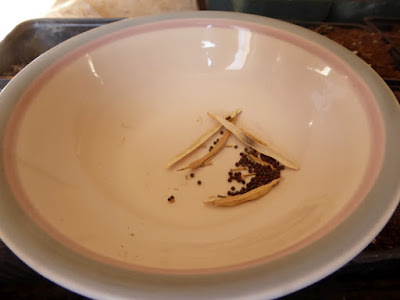 And Brussels sprouts seeds, also from our own harvest. The nice thing about heirlooms is once you get going on them, they're pretty much self-perpetuating. I didn't get any broccoli last year because the aphids got the plants, so I'm grateful to a neighbor who shared some of her heirloom broccoli seeds with me. Anyone else get anything planted? Nice to see you use your kitchen table! I use mine as well. I've only started two kinds of snow peas. One maturing in 60 days; the other in 70 days. I need to get the rest going as well. The good news is that most of my garden prep is done. I've been taking advantage of breaks in the rain. Slow and steady is my mantra and eventually the work gets done. Haha. Planted? Only if you consider baby chicks a planting. ;) 40 of them in the bathtub converted into a chick Brooder until it warms up a bit. Tomatoes, peppers and trying some Walla Walla onions. Other than that, I have everything ready to start cabbage and broccoli....I just need to get it done! I recently read that inter-planting Calendula with broccoli helps control aphids. I'm going to try it! Lots started on the inside but our grain bin house has limited windows and we've no greenhouse yet. garden too wet for much outside (we're in Illinois)but spinach is up and last falls garlic is taking off. Can't wait to get my hands filthy dirty! Another fine job. What are you using for soil medium? Your work is great as always. Guess am most impressed with the penmanship on the stakes, don't see that much anymore. You folks have a great weekend over there in N. I D HO. I was late getting mine started too. Crazy year so far this year, and not in a good way! Watermelon, cucumber, zucchini, sweet peppers, and banana peppers. 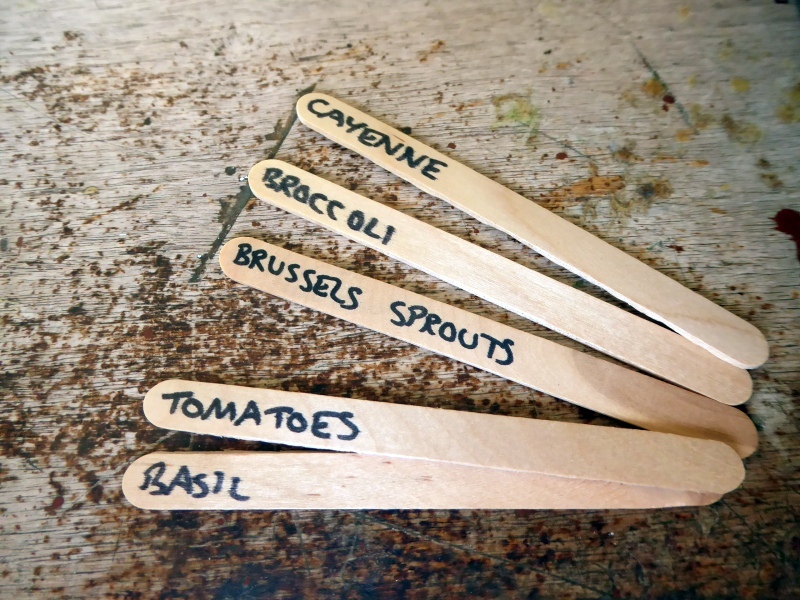 It looks like I've lost my tomato seedlings, so I'm going to try those again this weekend. Also it looks like it's now warm enough to plant the oregano, basil, and parsley. After years of starting seedlings in the house, with varying results, last year I started winter sowing. It worked out well, so this year I have broccoli, burssels sprouts, cauliflower, chard, mustard, kale, spinach, lettuce and toy choi sprouts just about ready to transplant into the garden. (Southern IN, zone 6) Already in the garden are peas, garlic, some onions (haven't gotten to all of them yet), radishes and potatoes. It's warm enough that I've already picked the first few asparagus spears. We've had a very mild winter with almost no snow. I'm just praying that the bugs don't decimate the garden because of the mild temps. Live in TN and have onions coming up and taters in the ground but not up yet. Started tomatoes inside and have other seeds ready. Is there any way to add a picture? I have 8 varieties of tomatoes started and some are fabulous ! I wanted to send a picture. 'Fraid not in the comments. We have tomatoes, cabbage, basil, and peppers started. 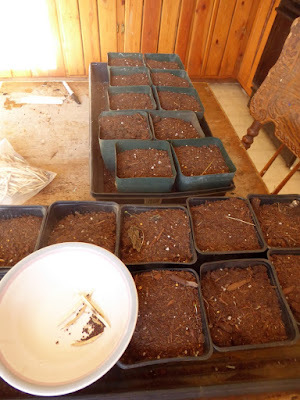 We'll transplant them twice to progressively larger pots before they go in the ground...more soil and containers used, but the seedlings are large and sturdy when they are planted in the garden just after Mother's Day!